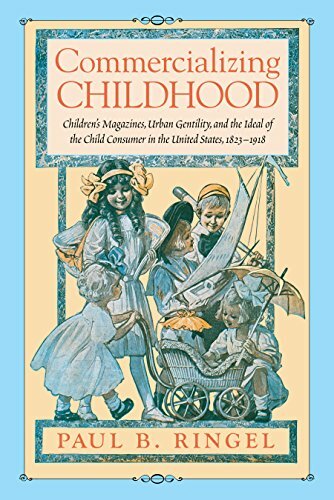 This book combines the stories within nineteenth-century American children’s magazines and the stories of those who produced them to explain how this hugely successful but largely forgotten industry trained generations of American children to become respectable consumers. Beginning with the emergence of the children’s magazine industry in the 1820s and continuing through the peak of its influence in the late nineteenth century and its incipient decline during the 1910s, Commercializing Childhood uses these publications, which were consumed on a weekly or monthly basis in hundreds of thousands of American homes, to reveal how white families struggled to balance their impulse to shield children from commercial influences with their desire to prepare young Americans to prosper in an increasingly market-driven society. Courtesy of the Early Juvenile Literature Collection, Martha Blakeney Hodges Special Collections and University Archives, University Libraries, University of North Carolina at Greensboro. Courtesy of the Lois Lenski Collection of Early American Children’s Literature, Martha Blakeney Hodges Special Collections and University Archives, University Libraries, University of North Carolina at Greensboro. Children’s magazines of this period were predominantly urban publications produced in Boston, New York, and Philadelphia. They were also thoroughly genteel, in the sense that they promoted a fervent belief in the achievement of economic and social ambitions through the development of upstanding Protestant forms of conduct and self-presentation. However, these magazines also reveal significant divisions of religious denomination, gender, class, and region within those respectable urban societies framework that led to competing visions of how such ideals should be instilled into the nation’s children. These magazines also undercut the idea that the engagement of American children as consumers was the product of decisions made by corporate or intellectual elites. Commercializing Childhood presents these magazines, and the behaviors they promoted, as the work of ambitious editors and audiences whose endeavors to achieve upward mobility through respectable commercial conduct created a blueprint for subsequent generations of American consumers. Paul Ringel’s impeccably researched and compellingly written Commercializing Childhood offers an important corrective to the assumption that children of previous centuries were “innocent” of the marketplace, or that they were unable to make choices among competing media...Commercializing Childhood, like many great histories, tells a story that seems quite familiar even as it covers largely uncultivated scholarly ground. Boston's Royal Rooters is a research project on the nation's first group of celebrity sports fans and why they chose to devote themselves to the city's professional baseball teams. The William Penn Project is a classroom-based research project on High Point, North Carolina's African-American high school before desegregation.